Daniel Brim was among the people trapped in an un-air-conditioned car on an Alewife-bound Red Line train that had started to leave Park Street when it suddenly just stopped around 6:30 p.m. He reports on the increasingly dire situation that ended only when people tried (and failed) to bust open a door and called 911 about heat stroke: Read more. The T reports delays of up to 10 minutes on the E Line due to a trolley that pulled up lame at Park Street. An Alewife train with what the T calls "a mechanical problem" is being taken out of service at Park Street and slowing down northbound service by at least 10 minutes. Chalked on the side of one of the entrances to the Park Street T stop this afternoon. An empty BC trolley coming around the loop at Park Street derailed this evening. No injuries. Service is continuing, but with only one track in use, instead of the usual two, expect delays. 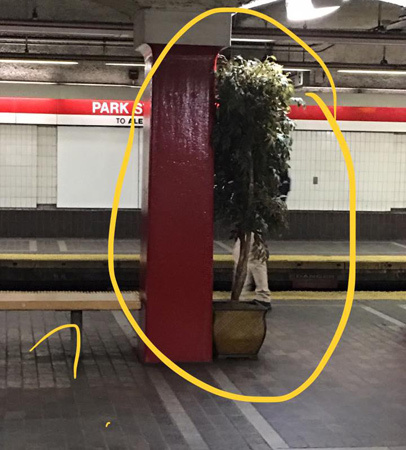 A motor on a Red Line car at Park Street began to smoke this morning, but the T assures us that "station fans have been activated to alleviate any smoke in the station." The MBTA reports delays of five to ten minutes on the Green Line due to a trolley that had to be taken out back at Park Street with a busted door. Earlier, a Red Line train couldn't make it out of Park Street, either, which was then compounded by signal issues at Charles/MGH. Today's slog hour on the Red Line is brought to you by a flatlined train near Park Street. The Red Line had two dead trains (at Park and North Quincy) and signal problems at Alewife during the morning rush. The Green Line had signal problems at Kenmore. 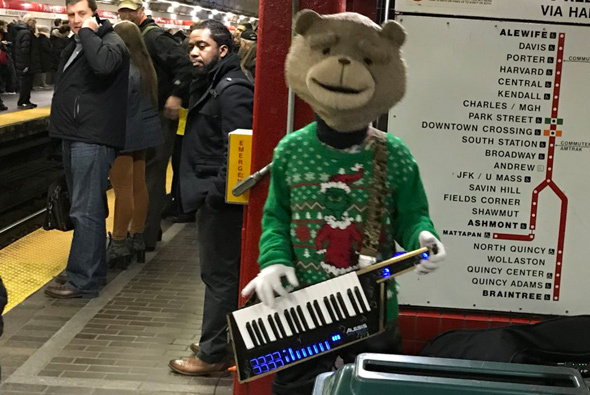 The MBTA reports "moderate" delays on the Red Line due to signal problems at Park Street. Our commute on the #RedLine is taking so long today because of delays, there are people who are actually doing yoga on the train because they're going to miss their morning workout class. What a time to be alive. The afternoon rush hour got off to a grim start when a Red Line train succumbed to old age at Park Street. Although T workers managed to remove the body quickly, the line still has "moderate" delays, the MBTA reports. "Moderate" delays on the Red Line due to the unresponsive train, the MBTA reports. The MBTA reports "moderate" delays on the Green Line due to a recalcitrant switch at Park Street. On Thursday, a woman stood outside the Park Street subway station, feeding pigeons - much like another woman did more than 100 years ago: Read more.